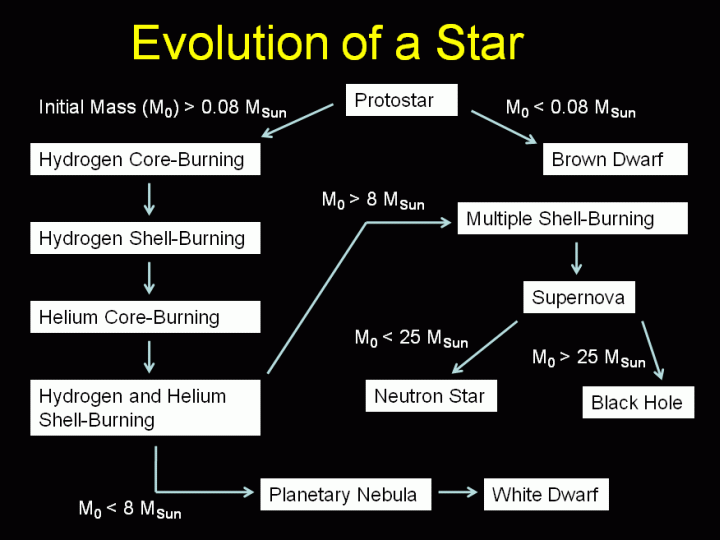 Evolution of Stars Revision Questions. 1. Describe how stars are formed. Rise in temperature and pressure as GPE (gravitational potential Energy) KE (kinetic energy). Temperature at core reaches 15 million k.
Outward pressure from radiation prevents any further collapseMain sequence star is formed. 2. Describe a stars death. Fusion restarts in a shell surrounding the core which is now rich in helium. Outer layers of the star expand and cool to form red giant. Helium nuclei fuse to form carbon. Red giant looses it’s outer layers in an expanding shell of gas. Core collapses to form White Dwarf. Cools eventually to brown and then black. Then Neutron star or Black Hole. 3. What is a supernova? 4. What is a Neutron star? Mass of sun collapsed into a sphere of 20km diameter. Intense gravitational fields cause them to spin. 5. 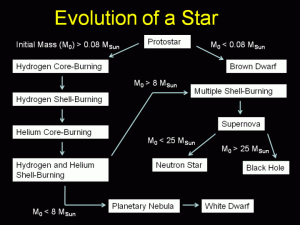 How can we deduce the chemical composition of a star? Each element has it’s own unique set of spectral line wavelengths. Analysis of starlight can tell us what the star is made of. 6. How can we deduce the temperature of a star? 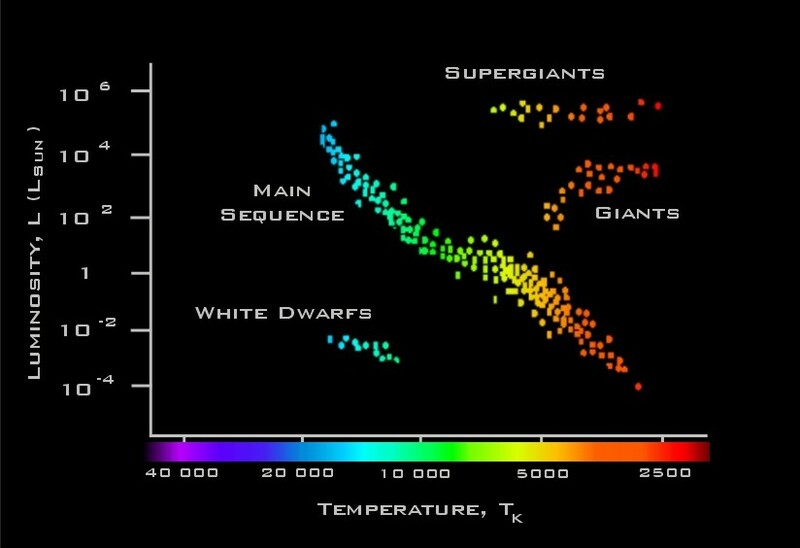 The temperature of a star determines it’s colour so spectral analysis can also be used to determine its temperature. 7. How can we determine the radial velocity of a star? Analysis of the Doppler shift of spectral lines. 8. Describe the Harvard classification of Spectral type. O is hottest and M is coolest. 9. What is a HR diagram? This is a plot of luminosity against spectral type. 11. Which stars will run out of fuel sooner? Massive stars (top left of HR Diagram). 61 Cygni is a low mass star and will spend 100′s of billions of years on the main sequence. 12. Give evidence for the existence of Neutron stars. Regular pulsating radio signals from Pulsars. 13. Give 3 pieces of evidence for the existence of black holes. Speed of rotation of our galaxy and its size hints that the mass at its centre is great enough to be a black hole. Charged particles spinning around a Black hole produce x rays which we can detect.